The PVX™p 15 powered enclosures deliver higher SPL while providing high-fidelity and impressive power using Peavey's legendary speaker and amp technology. These enclosures bring 800 watts peak of crystal-clear highs and deep low end, while using exclusive DDT™ compression technology to maintain clarity throughout the mix. 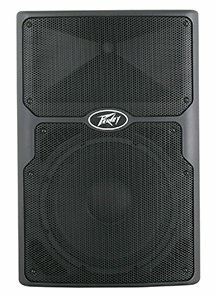 The Peavey PVXp 15 is constructed with a 15" heavy-duty, premium Peavey woofer with a 2-3/8-inch voice coil for the lows and low-mids, while the Peavey RX14™ 1.4-inch titanium diaphragm compression driver, coupled to a constant directivity horn, handles the highs and mid-highs.